Harley-Davidson, the iconic motorcycle manufacturer, is known worldwide as not just a brand, but also a lifestyle. 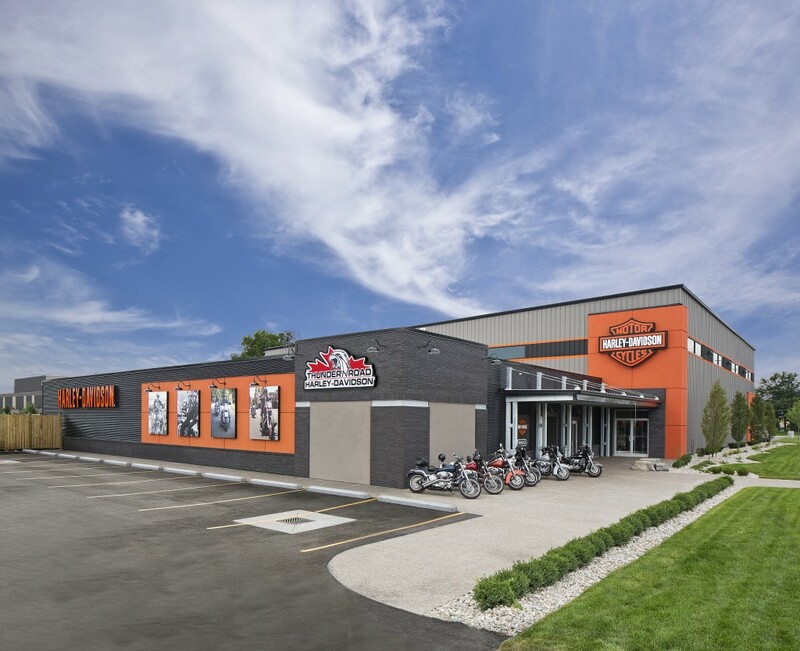 After serving customers for two decades in a 668-m2 (7200-sf) building that tripled as a showroom, service shop, and warehouse, the Thunder Road Harley-Davidson in Windsor, Ont., had outgrown its space. Owners Chris and Carol O’Neil purchased a nearby building, and the new 576-m2 (6200-sf) space was renovated. This addition served as the service department and warehouse for the next several years. However, by early 2013, the dealership once again needed to expand. The existing showroom was too small, the low ceilings did not offer a positive retail experience, and there was no warehousing space to store inventory. Two buildings were not conducive to customers visiting the retail area while their motorcycles were being serviced, and the best remedy was to combine the showroom and the service department into one efficient building. Renovating the service department made better use of the space, and allowed for increased service efficiency and warehousing capability. A local design-build firm was enlisted to construct the new addition. The owners also requested metal building systems for the facility’s renovation. Additional showroom space allows for quick product display and easy reconfiguration. Fundraising events also can be held in the area, which accommodates up to 1000 people. The existing structure housing the service department would remain intact so Thunder Road could still perform motorcycle maintenance for customers during construction. The sales building was demolished and converted to additional customer parking and the new showroom connected to the back of the service building. 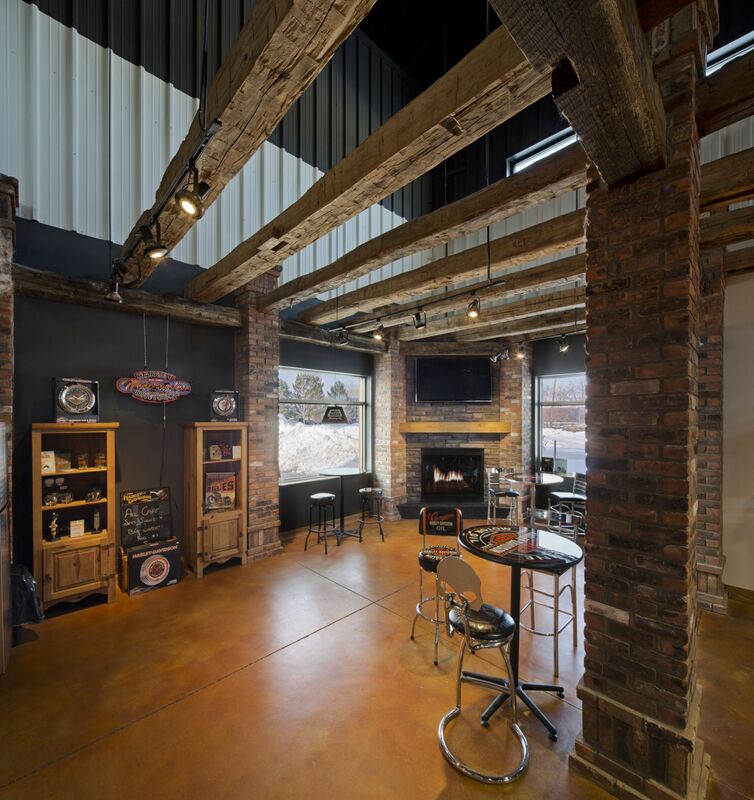 The project team worked carefully to adhere to Harley-Davidson’s corporate esthetic guidelines and the owner’s goals for the structure’s interior and exterior. The biggest challenge was the height requirement for the warehouse area. The space included four-bay concrete block offices topped with pre-stressed concrete for loading inventory. The plan called for three motorcycles to be stacked atop of each other for storage. The project team calculated how much weight the concrete would hold and worked through various height options to assure the owners there was enough height in the warehouse to accommodate these storage needs. The showroom features high ceilings with a mix of hard and soft design elements. Steel is tempered by warm colors, including the signature Harley-Davidson orange. The walls incorporate wood planks made from trees cut down from the O’Neil’s property. A standing-seam metal roof system was specified for its expandability and weathertight seam, which offered additional protection for the dealership’s high-value inventory. The showroom features high ceilings with a mix of hard and soft design elements. Steel is tempered by warm colors, including the signature Harley-Davidson orange. The walls also incorporate wood planks. In 2009, the Ontario government launched the microFIT program (i.e. feed-in-tariff) to increase renewable energy in the province. As part of the program, if residences or businesses install solar panels on their roofs, the government pays for the electricity they generate over a span of 20 years. Thunder Road’s roof was constructed to accommodate the weight of the panels and they will be installed on 1393 m2 (15,000 sf) of roof area this fall. Despite having 50 per cent more space, Thunder Road’s heating costs have dropped by one-third in the new space, compared to the cost of heating the separate structures, as a result of the new roof. Connecting the sales and service areas has been, as hoped, great for business and the owners think the new structure will provide Thunder Road with at least 15 years of growth before they need to think about expanding again. 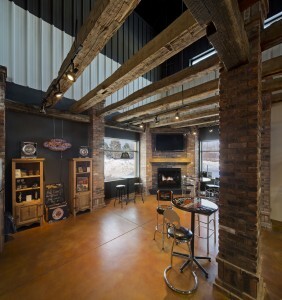 The open-concept showroom makes it easy to display product and reconfigure it quickly. 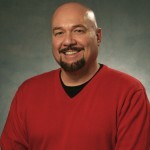 Kevin Hutchings is the training manager for Butler Manufacturing and is responsible for product, builder management, and sales training. He joined Butler as an order technician for the buildings division and in the retrofit roof group, where he gained substantial experience in metal roof design and detailing. Hutchings has also served as project services manager for the roof division of Butler, managing numerous complex retrofit roof projects. He can be contacted at jkhutchings@butlermfg.com.